Freedom isn’t free. Inspired by classic tattoo designs, the Freedom Mirror embodies an appreciation of freedom after being confined. Originally, sailors received a swallow tattoo after an extended tour at sea. Later, the practice was adopted by ex-cons after release from prison. This piece is balance of opposites: confinement and freedom embodied by barbed wire and a swallow; beauty and pain: roses embedded in a wreath of thorns. Reflected in its glass is blue sky and clouds (a rarity in Southern California). 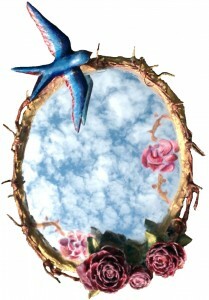 Papier-mâché, barbed wire, cedar roses and acrylic paint built around a 9″ oval mirror.